Ronald David (Ron or Ronnie) Wood (born 01 June 1947 in Hillingdon, London, England) is an English guitarist, singer/songwriter, painter and writer, best known as a member of The Rolling Stones (since 1975). Ronnie was raised in a musical family. His older brothers, Art and Ted, were active in the skiffle & traditional jazz scenes. Ronnie has been in The Rolling Stones since 1975. He previously was a songwriter and backing musician with Rod Stewart when both were in 1970s rock group the Faces. Ronnie was raised in a musical family. His older brothers, Art and Ted, were active in the skiffle & traditional jazz scenes. Ronnie has been in The Rolling Stones since 1975. He previously was a songwriter and backing musician with Rod Stewart when both were in 1970s rock group the Faces. Wood met Stewart when they were employed in the Jeff Beck Group in the late 1960s. Prior to that Wood had been in bands in the London mod scene: The Birds, who dissolved in 1966, and - very briefly - The Creation. Wood is an accomplished artist (painter), he collaborated on numerous all-star musical projects and recorded several solo studio and live albums. His autobiography, entitled Ronnie, was published in 2007. As a solo recording artist Ronnie Wood is a particularly tricky case when it comes to Last.fm stats. 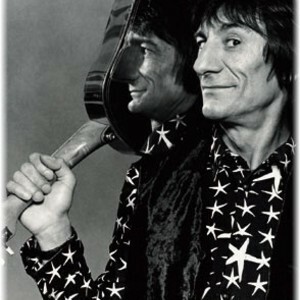 On the sleeves of two of his studio solo albums from the 1970s his name is Ron Wood. However, since 1980 he has put out all of his albums as Ronnie Wood.